Derdack invites their European customers to Berlin, Germany for this year’s official European User Group Meeting. 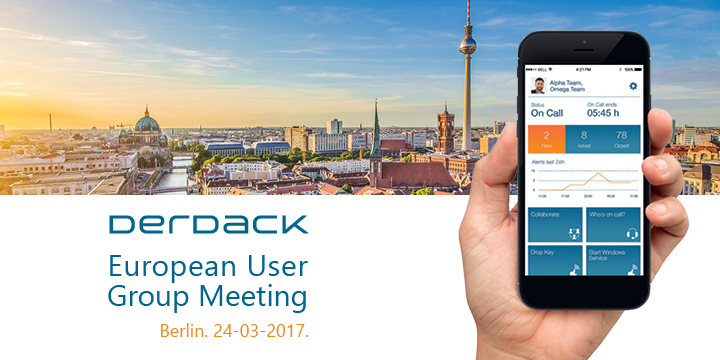 Derdack European User Group Meeting – Berlin, Germany – March 24, 2017. Our European user community will meet for this one-day event covering some great product news and content, training and of course fun! Break-out sessions, hands-on labs and 1:1 meetings ensure interaction and direct discussions with our R&D team and technical experts. Customers get to influence future product versions and share actual use cases with the community. And no user group meeting without some fun – we will take our community on a group adventure through historic Berlin. Find the agenda in the following! Our Derdack Team is looking forward to seeing you in Berlin! In case of any questions, please contact our event team!